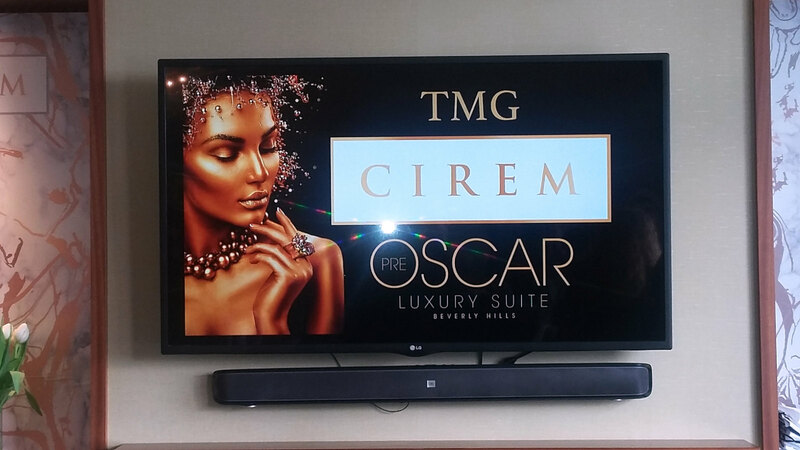 We selected TMG + Cirem Cosmetics Pre-Oscars Luxury Suite as the last stop on our ‘Tour d’Oscar 2018’ for a reason. After our marathon sprint around this past week’s bustling super-suites, there’s something nice about a party involving lots of relaxing, pampering, and comfy sofas to rest our still-weary feet. Ironically, TMG’s get-together was built around an underlying theme of travel and flying. One of the star products, Passport to Beauty, presented an ingenious new entry in the subscription beauty box world. Founder Shalini Vadheras taps in to the thrill every woman experiences when she stumbles into gorgeous and unusual beauty products on her travels. The box offered to A-listers, based on the vibrancy of Barcelona, not only had covetable beauty items but also lifestyle accessories, such as a stylish scarf with a flamenco feel, and a handy booklet with tapas ideas and recipes. Practical homeopathic remedies by Zicam provided real world balance to Vadheras’s finds. The room anchoring the other end of the suite was dedicated to the power of cannabis in its edible, inhalable, topical, and wearable formats. Jewellery designer Genifer M reinvented the leaf with her elegant diamond-encrusted pieces with a decidedly non-hippie flair. Hora and W!NK had the powerful oil worked into a number of beauty products and wellness prescriptions while a company called Punch Edibles got its point across with sample bags of its edible treat. Maison Louella offered delicate and feminine statement pieces, while top sponsor skin care line Cirem was packaged like fine jewellery, down to an accompanying handy metal applicator that cools the skin, firms, and tones while the user distributes the product. Developed by an experienced chemist, Cirem not only combines cutting-edge skin care ingredients, but is formulated with an advanced delivery system for deeper product penetration. Attendees got the star treatment with red carpet hair styling from Ouidad and photo-op-ready make-up application from Ginny Cosmetics. Given the rain and humidity that befell revellers during Oscar weekend, hair care line Ouidad was a welcome sight for many looking to use their hair appointments as a way to see how the ‘curly hair expert’ tamed frizz and other hair mishaps. OPI had Portugal on its mind, while TNL—The Nail Lounge provided the finishing touch of a mini-manicure with shades from the new line.